Tablet Deployment Replaces Trolley-based Solution. 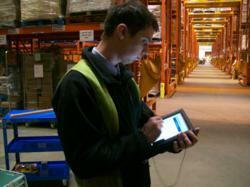 Europe’s biggest single price discount retailer, Poundland, has gone live with a deployment of Motion® F5 Tablet PCs in two warehouse hubs in the Midlands. The specialized tablets replace cumbersome legacy data collection equipment and significantly improve the productivity of Poundland Quality Assurance (QA) teams in both locations and ensure Poundland's supply chain keeps pace with demand. Working within the two hubs, the QA teams are responsible for ensuring correct stock availability and timely delivery to over 385 Poundland stores nationwide. Every box must be opened and samples of the goods checked. Type, quantity, color and contents must all be cross referenced against the database in real time. The rapid reconciliation with expected deliveries and flagging of any discrepancies is paramount. When discrepancies are found, images must be taken for documentation, and as new items are taken into stock, they must be entered into the database. This was previously done with a cumbersome trolley-based system, including a laptop, scanner, camera and mobile battery pack. In a warehouse where space is at a premium, this legacy solution not only impeded other warehouse tasks, such as fork lift truck operations, but the poor battery life meant constant trips to recharge, reducing the amount of work that could actually be done in a given shift. In order to boost productivity and realize substantial cost savings on both the maintenance and support of the legacy solutions, Poundland turned to Box Technologies who specified a mobile computing solution built around the Motion F5 Tablet PC. With an integrated camera, digitizer pen and barcode scanner, a single Motion F5 Tablet PC now does the job of the previous four separate pieces of hardware. The improved battery life has led to an increase in productivity as warehouse operatives use the tablet’s hot-swap battery feature to easily replace an existing battery with a charged battery while the tablet is operating, with no need to shut down or standby, all on the warehouse floor. Mick Corbett, IT solutions leader, Poundland, commented, "Quality Assurance is a mission-critical task. The Motion F5 Tablet PC has brought huge benefits in our abilities to check the quality of goods and the speed with which we do that. We have eliminated a bulky solution that inhibited warehouse operations with state-of-the-art mobile technology in one lightweight and portable device." Poundland is Europe’s biggest single price discount retailer and winner of the 2011 Discount Retailer of the Year Award. It has over 385 stores and sells an extensive range of high quality top brand and own brand products all for the single price point of £1 each, providing customers with amazing value every day. Serving over 4 million customers every week, Poundland is an irresistible shopping experience where shoppers are guaranteed to find over 3,000 quality products and over 1,000 Top Brands, across 17 shopping categories including food and drink, health and beauty, household, gardening, DIY, Pet, Stationery, books, DVD’s and Toys. With a growth strategy of at least 50 new stores every year, Poundland is again on track to create approximately 2,000 new jobs. Box Technologies is the UK's leading provider of customer interface technology solutions, within six core market sectors: Retail, Hospitality, Finance, Public Sector, Utilities, Transportation and Logistics. As an ISO 90001:2008 accredited business, supported by direct relationships with leading manufacturers, Box Technologies delivers total solutions across five product lines supported by in-house service delivery teams. Motion Computing is a leading global provider of tablet PCs and supporting mobility solutions, combining world-class products with services customized for the unique needs of mobile professionals across vertical markets, such as field service, retail and healthcare. The company’s enhanced line of rugged tablet PCs as well as mobile point of service solutions and accessories are designed to increase mobile productivity while providing portability, security, power and versatility. For more information visit http://www.motioncomputing.com.